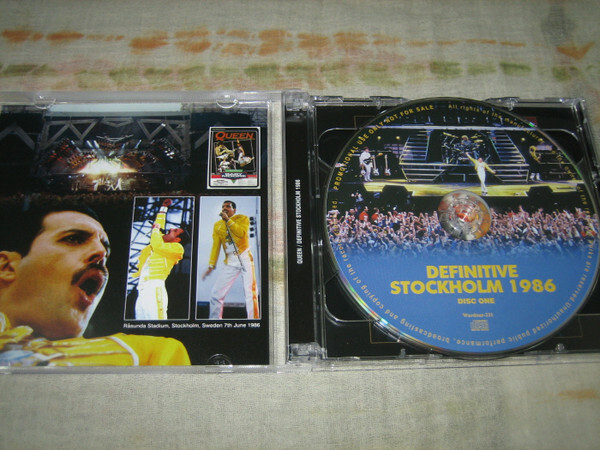 Recorded: Raasunda Stadium, Stockholm, Sweden June 7th. 1986. Comments: This is supposedly an upgrade from their previous 'Stockholm 1986: The First Show Of The Magic Tour'(Wardour 180). Roots: Well, originally from a audience tape recording, but it seems to be from more than less a master tape. You can read a review I found on internet below the track list. This show has been released before on 2cd & 2cdr. 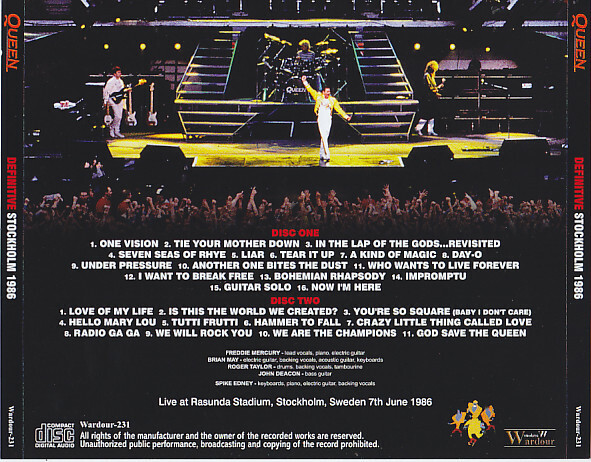 Our store just released as if to celebrate 30 years since the magic tour of 1986 which became the last live tour of Queen just a year ago from now is “STOCKHOLM 1986: THE FIRST SHOW OF THE MAGIC TOUR “. He called reputation among maniacs all over the world as a valuable source that captured the first day of the tour of glory. The importance of the magic tour that is stressed as time passes. Advantage of catching the start point and being able to listen on the press CD was too big. A stage full of tension that was unique only on the first day, which could not be captured by items of various official items that have been released something. In terms of sound quality, the audience recording of this day was not a level that can be ranked in the top of the tour even in compliments. Not to mention Vienna and Manchester, much less Berlin and Knebworth. Although it is audience recording in 1986, it maintained the level that you can listen without stress. However, if it gets a bit more rough … is not it the impression that everyone held against this sound source? One year since release of such sound source, our shop finally got the first generation copy of this Stockholm sound source. How much difference there is … such anxiety was blown away at the moment of playback. I already have a distinct upper feeling as I listen and understand. The clearness which literally coats all over is really wonderful! By this, it can be said that the point that the “roughness” mentioned earlier has been cleared up is the greatest advantage in this sound source. If the sound quality has this clearness, you can enjoy it without worry even if you are not a mania. And because the sound quality got better, the feeling of slime that is unique only on the first day of the outstanding tour. The magic tour full of that glorious atmosphere also showed such a restless performance on the first day … It is the real pleasure of rare sound source that such other side can enjoy. It is as mentioned in the release one year ago, but it is pleasant, especially during the first half of the show, the performance is running. This strangely fast groove feeling is quite different from the performance from the time the tour was on track. 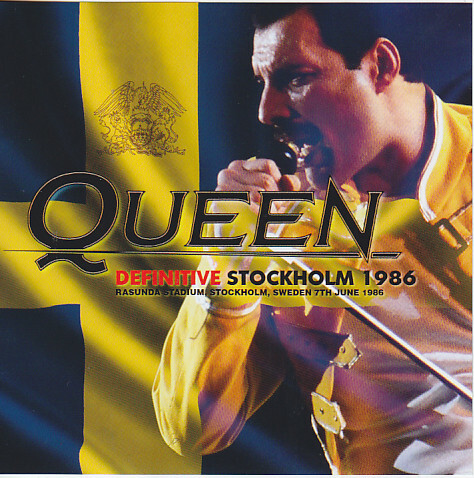 Even if it is unavoidable that roughness stands out by a song like “One Vision” that was just launched as a live repertoire, if it was originally supposed to continue playing for many years, the performance of rough stone should be obvious “Under Pressure “and” Another One Bites The Dust “are running as if they laugh. In the latter case Freddie was so nearly as to lose singing out dangerously. While coarse scores of such performances are found, it is also the point I want to say that Freddie’s voices are clearer as it is the first day of the tour. Especially if you are accustomed to listening to the official Wembley stadium, this area will be freshly reflected. As I repeat many times, the instability of the performance of the band is noticeable in the first half of the show, and it seems that Freddie is becoming nervous, but still it is still possible to listen to a really singing voice It feels good. Only on this day the fact that “Bohemian Rhapsody” was treated as “regular repertoire” played in the first half of the show is also a topic unique to the first day of the tour, and Freddy’s singing voice to listen there is also great. The singing voice that stretches outstanding is unexpected enough to make it reminiscent of 1981 or 82 years. Freddie’s voice is top-notch, taking the back performance playing the momentum as she sometimes ran. And after “Love Of My Life” it is hard to get the hardness so far, but it is also brilliant that the band will listen to the light performance of the legs. It would be obvious that they were released from tension as the Oldies Acoustic Corner, a popular part of the night in the Magic Tour, performed successfully. After that, four people listen to their favorable performances, and “Radio Ga Ga” etc is quite a gorgeous performance. It was also full of vitality unique to the first day of the tour. However, encore is interesting because “Friends Will Be Friends” is not incorporated in this day only, and the show is finished in the same development as past tours. Originally the first day of the tour only captured the happening and momentum without leaving anything, Mania has a reputed sound source. However, with the appearance of the upper version this time, more listeners will be able to enjoy the first day of the magic tour. Upon CD conversion, we adjusted the pitch which was randomly mad from the middle stage, and realize more complete recording. The sound source that has been referred to as “recorder 1” in our CD – R “SWEDISH MAGIC NIGHT” that we invented in the past last year was a long – awaited press CD with “STOCKHOLM 1986: THE FIRST SHOW OF THE MAGIC TOUR”. And this time, with the appearance of an undisputed upper version by using First Generation · Copy, the definitive version of legendary tour first day will be released that mania all over the world would have been waiting for. Really full of listening to the last!